It’s that time of the year again – zucchinis are coming out of my ears. I’m constantly dropping off the extra at friends’ and neighbor’s houses. I’m known as the zucchini fairy in several circles. Late in the season, I start leaving the zucchinis without ringing the doorbells, because I’m pretty sure that everybody else is done with zucchini also. 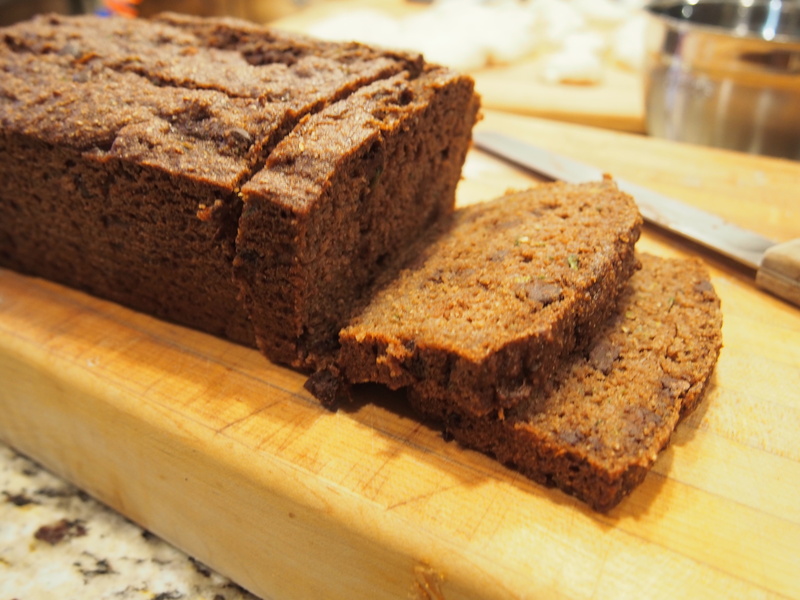 This is a great recipe for zucchini bread. I really like it because it is not overloaded with fat or sugar. Of course, using whole wheat flour makes it even healthier. But it tastes so good, that you wouldn’t even know that it’s a little bit healthy. It also freezes really well. I often make a triple batch and freeze the extra loaves – just wrap them in some tin foil, freeze, and use within a couple months. A couple tips to make your bread even better. You can peel the zucchini to get rid of the green skin. 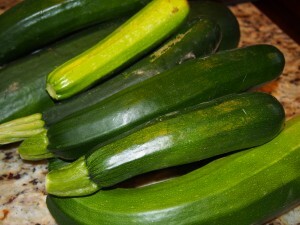 Also – if your zucchini is a big guy, you can quarter it and slice out the seeds. To shred the squash, use the larger shredder disk on your food processor or shredder attachment on your mixer. If you don't like little bits of green in your zucchini bread, just peel the zucchini before you shred it. Preheat oven to 350 degrees. Oil a large 9x5 inch loaf pan. Combine sugar, oil, and eggs in a large bowl. Combine with a whisk. Whisk applesauce into sugar mixture. Combine flour, cocoa, soda, cinnamon, and salt in a separate bowl and add into sugar mixture. Stir until just combined. Add zucchini and chocolate chips to batter. Don't overmix. Pour batter into prepared bread pan. Bake 50-60 minutes until toothpick inserted into the center comes out clean. Let cool a few minutes in the pan and then turn out onto a cooling rack.